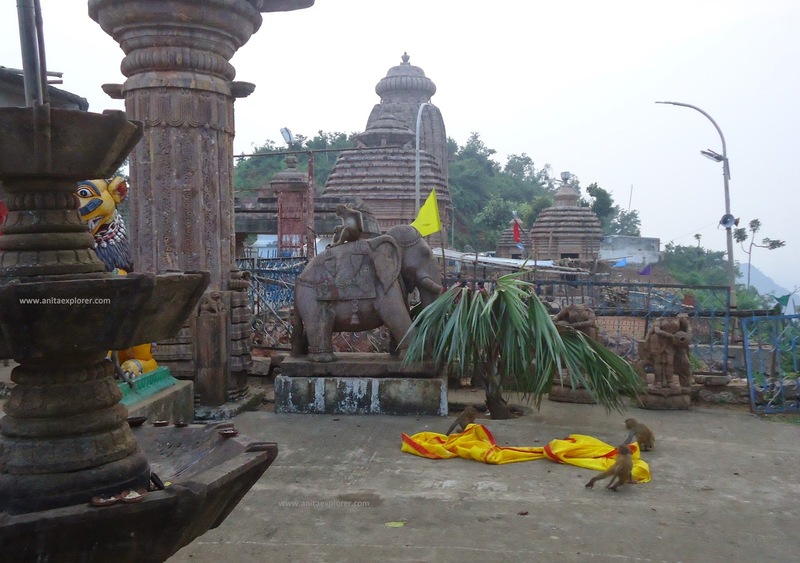 A few weeks ago, we visited the Maa Tara Tarini Temple in Berhampur, Ganjam, Odisha, India. We were treated to a unique sight. Some monkeys had united to play together. They had managed to catch hold of a Saree (an Indian costume worn by ladies). They were finding the yellow Saree a precious plaything & a useful source of enjoyment! It was evening and the light was fading. Still, I couldn't resist myself & clicked some pics. Guess how many monkeys are hidden under the Saree! Apart from the antics of the simians, don't miss the picturesque beauty across the fence. How many monkeys are behind the fence?! I found this entire experience very unusual! The priests asked me to back off lest the simians should attack me! 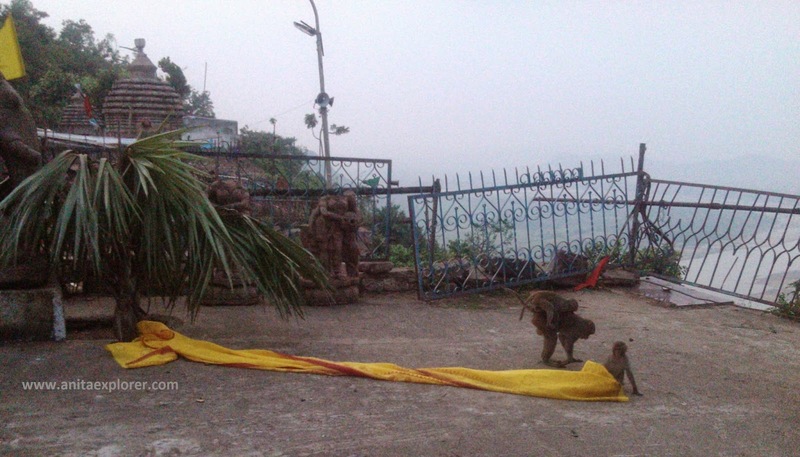 Have you ever seen monkeys playing with a Saree or with any other garment? If you ever spot such a sight, would you find it precious & unique? Do you attempt to click pics using whatever camera you have, though the light is fading? How do you like these pics? Which is your favorite pic? Please share your honest feedback in the comments below. Our World Tuesday - Hurray! Thank you for this unique fun post! I will never come opportunity to make such photos, great snapshots! Monkeys are at monkey business again. Great pics. I think the funniest one is with the monkeys under the cloth, hiding and playing. They are just like little kids! The fence is quite interesting, and I'm sure the river is also beautiful. the monkeys are cute. i would be glued to watching their antics and photographing them too. Fun post!! Loved the last pic! You got some good action shots. Each is good. couldn't really decide which is the best. I liked the last pic the most. Here in our layout, we sometimes find a family of monkeys visiting. They are very ruthless and ruin our plants. I always like watching monkeys and very much enjoyed your pictures. Superb set of monkey pics. Reminds me of Govt. 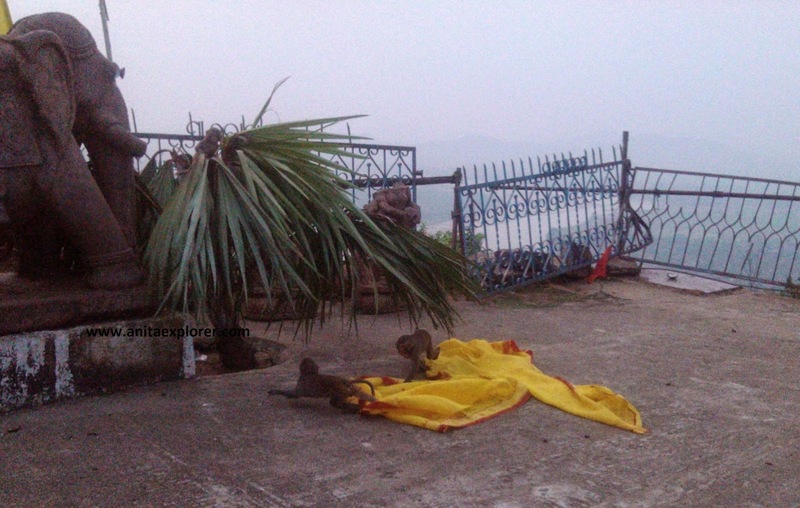 Guest house in Mahabaleshwar where monkeys are a very common sight. Wonderful pictures, I too , like the last one. .There may be a lady somewhere missing her Saree right now....Naughty monkeys. It seems like a wonderful place. Beautiful pictures. Thanks for sharing, Anita. They look funny and cute, as long as it is not us. Nice catch. 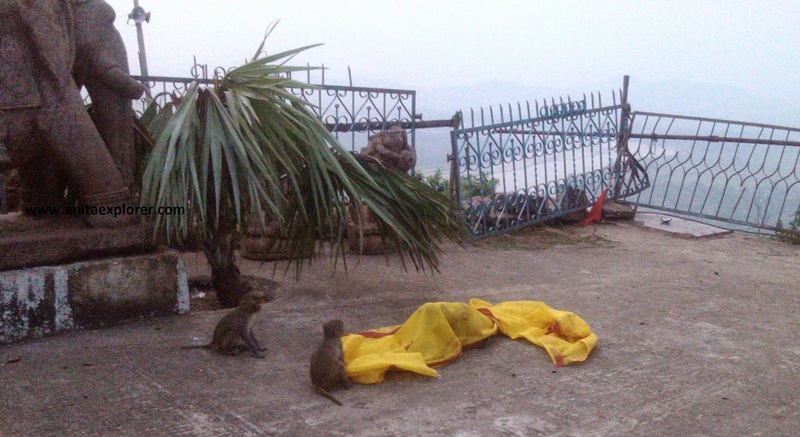 Monkeys and a saree. I would call them precious pictures. I would have pulled out my phone and captured the scene too. Such fun pictures, looks like they have had hours of fun. They definitely look like they're having a grand ole time! What fun! I would be very afraid to be that close to the monkeys. When I visited Costa Rica, the monkeys stayed in the trees above us...and threw things at us! Wonderful Pictures that are also amusing..
Wow! What a lucky shots. I bet they are quite entertaining to watch. Even I do click pictures whenever I see something interesting... Recently, I started to simply watch what happens, instead of losing the moment in getting camera ready. 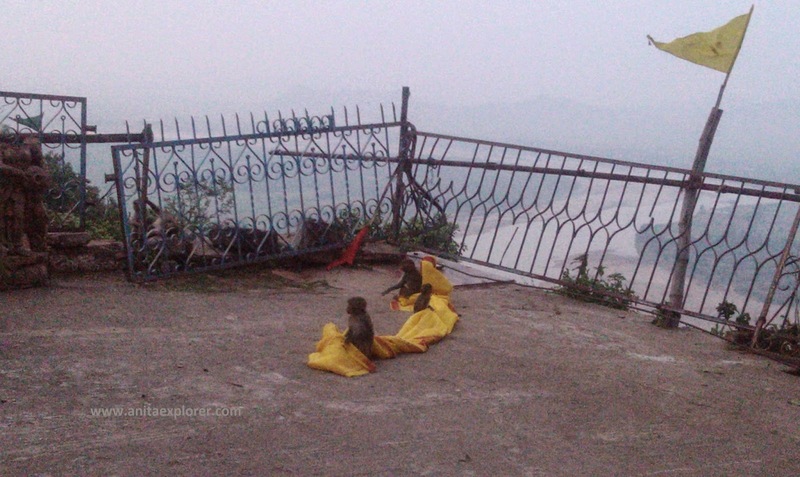 We saw a group of monkeys at Ellora, climbing on the shoulders of men... Have clicked a few, yet to share in my blog. My favourite photo? 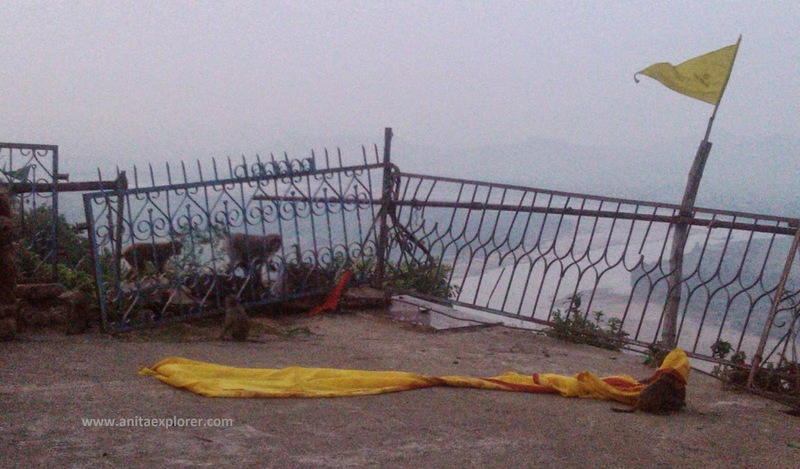 That one with monkeys hidden in sari!